Law firms, I am convinced, house one of the highest concentrations of crazymakers of any work environment. There are lots of reasons for this: valuing rainmaking above all else, severely undervaluing how much more productive a positive work environment is, the horrid management skills of most lawyers and their predominant personality type (Meyers-Briggs ISTJ)—those are among my top candidates. Doubtless there are other contributing factors, too. Feel free to chime in about those in the comments! 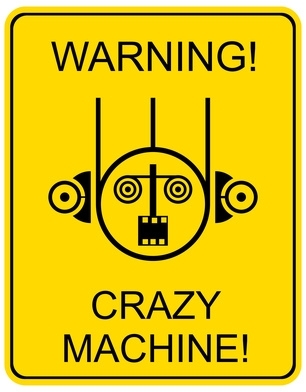 Don't you wish crazymakers came with warning labels? But really, if you work with one, the why of how crazymakers rule the roost matters so much less than the how of dealing with them until you can make good your escape. But before I get to coping strategies that work, let’s back up for a second and define what a crazymaker is. Crazymakers destroy schedules. Like, your long-awaited vacation, due to the partner’s lack of planning. Crazymakers expect special treatment. You know, the partner whose work is always the most important. Crazymakers discount your reality. They tell you that you shouldn’t feel upset when they tear apart your carefully crafted brief but give you no useful suggestions for improvement. Or that they worked while feeling ill, and you should, too even if you nearly faint on the way to the loo. They violate your needs daily, if not hourly. Crazymakers spend your time (not theirs). Like when they forget to tell you the super-tight deadline to get that contract drafted has been moved back by 3 weeks—after you’ve pulled several 15-hour days and pissed off your spouse/kids/significant other. Crazymakers hate schedules—except their own. As Cameron points out, “In the hands of a crazymaker, time is a primary tool for abuse.” Sound familiar? Crazymakers triangulate those they deal with. They play you against other associates, for example. As in, the partner who assigns two junior associates the same work, to see who does the better job. Nasty indeed. Crazymakers are expert blamers. It’s never, ever their fault. And it’s usually yours. “Well, you should have known I meant to make those edits.” This behavior is so prevalent among lawyers I actually developed a mantra: “I do not practice psychic law.” And said it to partners on occasion. Crazymakers create drama. Like the partner who decides, two days before a big brief is due, that the approach the team has been working on for weeks is completely wrong. Crazymakers hate order. As in, unapologetically piss-poor planning skills, and sending people down obscure research holes when a huge filing is due. First, do not waste one millisecond of time trying to change the crazymaker’s behavior. They are going to act crazy regardless of what you do, because they don’t know—or care—how to act any differently. If you “fix” one of the “faults” they identify, they will just move on and find another alleged fault. It’s a vicious cycle and the only way to get out is not to play. Often this will bore the crazymaker and s/he will move on to another victim. This isn’t to say you shouldn’t work to improve your skills, but do it for you, not to appease the crazymaker. Second, focus on yourself. When you find yourself fuming over the latest crazymaker episode, purposefully shift your thoughts to something different—your happy place, something you savored, or the next step you can take in your quest to find a different job or life. Or all of them! Don’t let the crazymaker have space in your head rent-free, my friends. Third, do some reading on co-dependency. There is a reason you got into this crazy dance, and that reason is worth understanding. Continuing to engage the crazymaker dissipates your energy and keeps you stuck in the job you hate—and your true inner self knows that isn’t what you want or deserve. Above all, be extra kind to yourself. The crazymaker dance is draining and demoralizing. You need to build some reserves, and being kind to yourself is an excellent way to do that. Jennifer Alvey is a recovering lawyer whose calling is to coach people on getting out of crazy work environments like law firms. The craziest boss she ever had was a lawyer, but didn’t work in a law firm–go figure. Where have you encountered your craziest boss? Drop her a line at jalvey AT jenniferalvey.com. I’m currently dealing with severe burnout as a result of having worked for a crazymaker. I left because my body and mind could no longer function properly under the stress. I’ve battled continuous sinus infections and other problems with my immune system. I’m pretty sure the crazymaker for whom I worked is a narcissist, among other things. I stayed far too long because I was afraid I’d find myself in a worse situation (the “devil you know” frame of mind). I’d also invested a considerable number of years at my firm and am overly loyal by nature. Now I’m paying for it healthwise. I have no idea what’s next for me, but I’m thankful every day that I’ve extricated myself from my boss’s delusional world of psychological games. I highly advise anyone who’s in a similar situation to get out as soon as possible. Jonathan, good for you! It is a very tough situation to extricate yourself from. And it often takes a crisis to recognize it. Enjoy your freedom, you deserve it. I think a lot of if has to do with the billable hour and constant downward pressure from clients to cap legal bills. I know that once I left the world of the billable hour for the world of the contingency fee, my stress was greatly reduced. I’m in the practice of disability law now, so I am encountering people will all kinds of mental health issues as clients. Dealing with people who hallucinate and periodically try to commit suicide (or try to commit suicide and miss – yes, this happens) is actually much more pleasant than billing hours for corporate clients. In my 20 plus years working in law I worked for all sorts of crazies. I had attorneys insist on my cancelling appointments at the last minute because their project involved a lot of money. In one case it was a hair appointment and it was too late for my hairdresser to work another appointment in so she lost money and I think the least the attorney could have done was paid for the missed appointment. I also had one attorney return a deposition notice i had prepared and told me to read through it and figure out what was wrong with it. I couldn’t figure it out and think he could have saved us both a lot of time just talking to me about it. He was not a good communicator probably because he had such an inflated opinion of himself that he thought he didn’t have to explain himself to anyone. This same attorney rudely terminated me after two months claiming it wasn’t a good fit but refused to cite instances. I also worked for an attorney who frequently asked me to put in overtime. Most of the time I could accommodate him and didn’t mind it (I enjoyed the extra money). However, 10% of the time I couldn’t and he would get indignant when I’d say no.